If you’re looking for a bumper sticker to sum up how President Obama has handled what we inherited, it’s pretty simple: Osama bin Laden is dead and General Motors is alive. Also yesterday, Time Magazine rolled out a Peter Bergen article, The Last Days of Osama Bin Laden (which is still behind the paywall), accompanied not just by a bunch of other piggy-backed articles, but the letter above, Leon Panetta’s record of National Security Advisor Tom Donilon’s call telling him the operation against OBL was a go. I guess we’re supposed to assume the timing of the two events is entirely coincidental. The other event that transpired yesterday–Judge James Boasberg’s order ruling the CIA had properly withheld 52 photos taken during the raid on OBL’s compound under FOIA exemption 1 (properly classified information)–probably was just a coincidence. But it does remind us that the photos–that is, records of the same covert operation as Leon Panetta’s note recorded–were immediately stamped “Top Secret,” considered derivatively classified, and subsequently formally classified and withheld from FOIA. 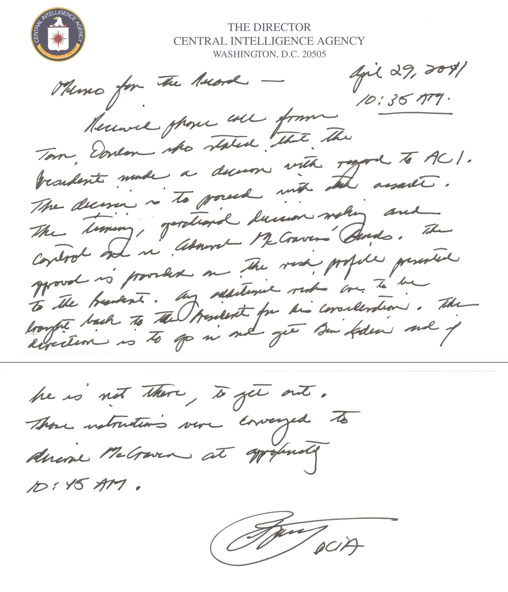 And yet, here Panetta’s note is, somehow having evaded the classification stamps. That, in spite of the fact that it records the normally religiously guarded Presidential communications, not to mention details of how CIA and JSOC work together on covert ops, the time it was officially okayed, that McRaven was informed first even though CIA was ostensibly in charge of the op. All of it stuff that, had the op blown up in Obama’s face, would be as carefully guarded as those pictures of OBL’s funeral. In my mind, this whole festival of information asymmetry targeted at voters is capped off by the byline involved: Peter Bergen. When I read about the imprisonment of journalists like Abdulelah Haider Shaye, or the wiretapping of Lawrence Wright and Christiane Amanpour, I think back to Bergen, who in the days after 9/11 was an important, reliable source who knew more about al Qaeda than many of the people taxpayers were paying to keep us safe. I’ve always thought, as our government targets journalists covering Islamic extremists, we’re handcuffing the next Peter Bergen, that journalist who is right now collecting the information our intelligence community is neglecting.That Peter Bergen is likely to be imprisoned, like Shaye, for talking directly to a terrorist. And what has Bergen become, along the way? The outlet for officially leaked information–one more tool in the President’s toolbox of information asymmetry. I don’t blame the Obama Administration for running on Joe Biden’s pithy slogan. But I do blame it for corrupting information in this way, both the system of classification that should be free from politics, and the space it accorded journalists to do their job when the government wasn’t. Update: See this for details of how Brian Williams will film Obama and friends re-enacting last year’s Sit Room drama as they killed OBL. Update: One of the things Judicial Watch complained about in their OBL suit is that the photos were probably classified only after the government received their FOIA on May 2 (to DOD) and May 4 (to CIA). CIA Information Review Officer Elizabeth Anne Culver explained that the CIA always considered the photos classified. Contrary to Plaintiff’s suggestion, after their creation these extraordinarily sensitive images were always considered to be classified by the CIA and were consistently maintained in a manner appropriate for their classification level. 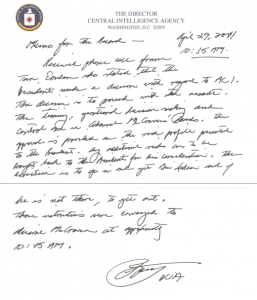 So wouldn’t Panetta’s note be considered derivatively classified, just like the photos? If so, why doesn’t have declassification markings now? I can’t imagine why Team Obama 2012 isn’t using the Awlaki assassination to politically show off their foreign policy chops, can you? “As tensions between Tehran, Washington and Tel Aviv continue to mount over Iran’s pursuit of nuclear weapons technologies, the U.S. has quietly begun a deployment of its premier stealthy fighter, the twin-engine F-22, to the United Arab Emirates. Multiple Lockheed Martin aircraft will operate out of Al Dhafra Air Base there, industry sources say. This is the same base from which U.S. U-2s and Global Hawk UAVs have been launched since shortly after the 9/11 terrorist attacks. This may all be bluff/counterbluff gamesmanship, but who can trust Batshit Crazy Bibi? My Obama bumper sticker would read: Osama bin Laden is and the 4th Amemndment are dead and General Motors Wall Street are alive. I don’t know. I kinda don’t care. Who needs citizens? Who needs government? They’ve divided this house against itself. There’s a paywall like 99% of us can’t get through and a consciencewall like 1% of them can’t get through. They cannot fathom conscience and humanity. They cannot stand reality checking. Not the light! It is what it is, and I think they’re stupid. Citizens can constitute new governments, it’s something we do, but I don’t think governments can constitute new citizens. We are quite simply …a commodity… continuously fed propaganda..smiling all the while on the way to the inevitable slaughter. Volunteer victims,bleatingly accepting indentured servitude for future generations to come. Let’s see how it works to go to your bank and say, “I always considered my payments optional”. Either the photos were classified or they weren’t – you don’t get “consider” them anything in an honest court of law (I say “honest” because the courts have become so deferential to Executive power, there’s nothing “honest” about these cases). Did you really think they’d let this opportunity go by to stick it to the GOP, and remind everyone that it was Obama that made killing OBL a priority? Especially against a dope like Mittens who admitted, like W., that capturing/killing OBL just wasn’t that big a deal. Where is OBL’s body again? @Mary McCurnin: That’s what I keep thinking. Wheel of distraction, and you can’t believe anything they say. They lie, they kill, they pose. They can’t help themselves. They are not my beautiful country. @Gitcheegumee: No… I don’t think so. I think they are vanishing. They’re hollow, they’re substanceless, they’re soulless, they’re cut off. A disembodied head? Good luck with that. They believe we think in Disney terms. Not so. @Mary McCurnin: I believe its in Davy Jones’ locker. Government is a hologram…or should I say …hollowgram? @Carl Weetabix: We are in an authoritarian dictatorship now where Due Process doesn’t equal Judicial Process. The Dictator can just kill people on a whim, only will provide the official story and will imprison anyone who attempts to whistleblow the truth. @Phil Perspective: Clearly killing OBL wasn’t that big of a deal to Obama – nothing has changed. We’ve still got the Patriot Act, etc. You don’t see Obama trying to roll back the laws that were supposedly put in place because of OBL. Whether OBL is alive or dead, the perma-war goes on with no desire from the Constitutional Scholar to give us our rights back. It is built on lies. It works only as long as people are willing to live within the lie. But the moment someone breaks through in one place, when one person cries out, “the emperor is naked!”–when a single person breaks the rules of the game, thus exposing it as a game–everything suddenly appears in another light and the whole crust seems then to be made of a tissue on the point of tearing and disintegrating uncontrollably. @spanishinquisition: Right. It’s illegitimate. And it doesn’t work. Everyone can see that. So who needs THAT government? That government is dissolving itself. It can’t help itself. Rot rots, rotten begets rot. And then new things grow. I expect people will look for something that is legitimate and does function properly, because they need to, they have to — there’s a reason governments exist. So I expect they will constitute that. @Gitcheegumee: Actually I like occupy. When I looked again at the Matrix youtube I linked to, it just hit me — that’s what occupy, occupying the Matrix, would look like. It just made me happy to see it. We can do this! Look, it’s do-able. I do so want to live within the truth.